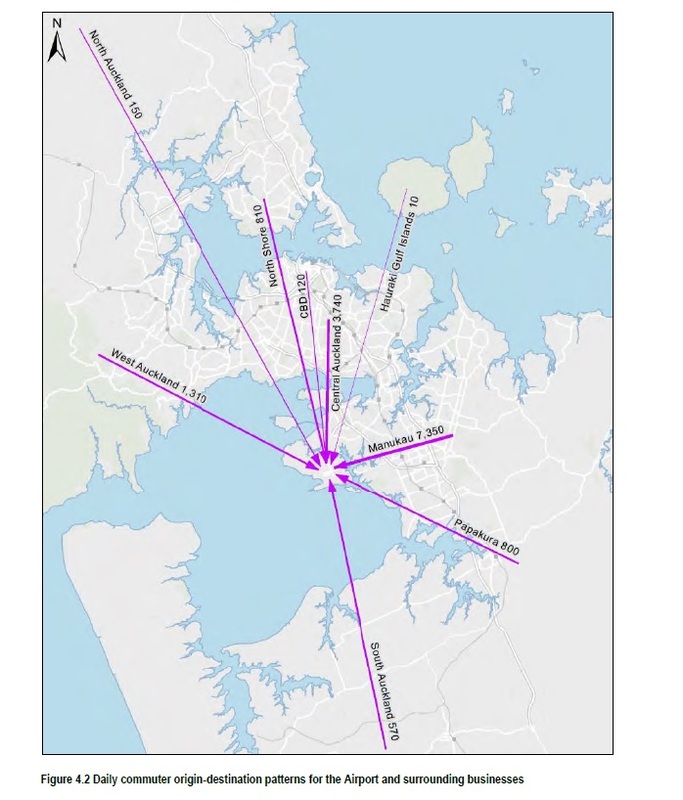 Greater Auckland posted up on the different routes the Northern Airport Line (City Centre to the Airport) and the consequences of the different routes. 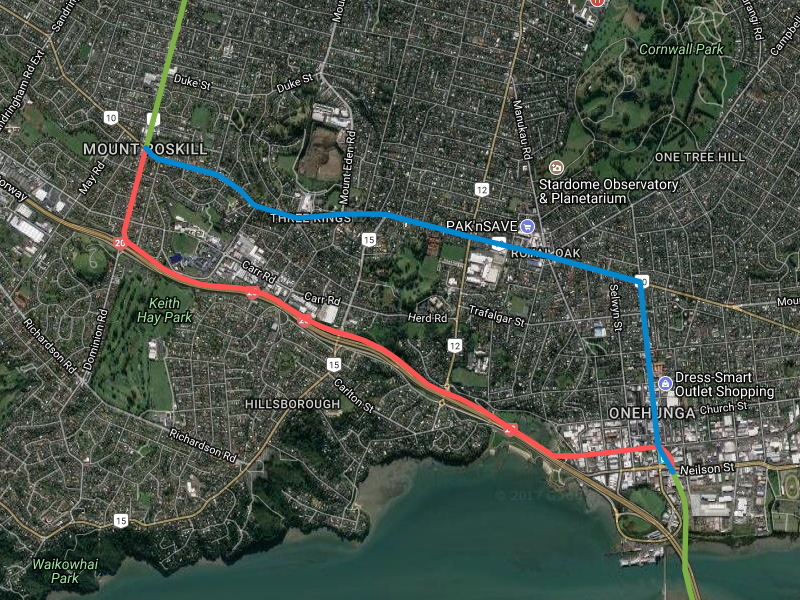 Just a quick note that the Northern Airport Line will be running down SH20 and SH20A both motorways from Mangere Bridge to the Airport unless the line goes down Kirkbride and McKenzie Roads and then swings onto SH20A. What is the Purpose of the Northern Airport Line? If we are to answer Greater Auckland’s deviation of the Northern Airport Line then the question of the Northern Airport Line’s purpose needs to be answered first. Is the purpose of the Northern Airport Line to “express run” from the City Centre to the Airport or is its purpose to maximise catchment to an area that does not have a decent transit network (I am thinking of heavy rail and the Northern Busway). 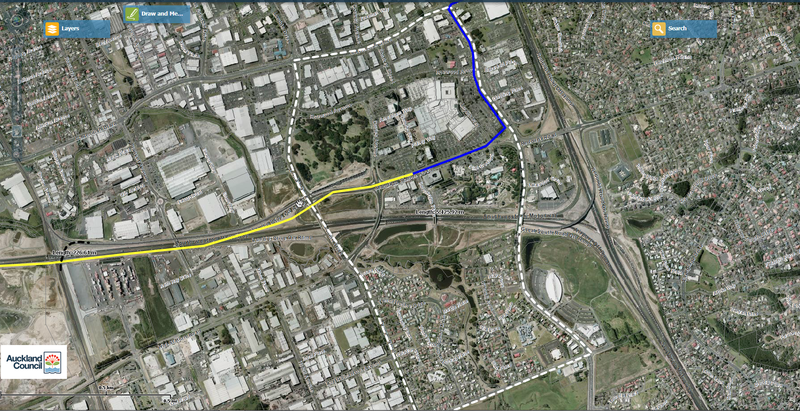 Greater Auckland technically answers the question: maximising catchment of the line. Remember the Northern Airport Line is designed to offer a quality transit line for the Isthmus to either get to the City Centre or to the Airport through that maximisation of the its catchment. The Northern Airport Line was not and should not be considered for “express running” to the Airport from the City Centre. The Southern Airport Line via the Southern or Eastern (heavy rail) Lines and a transfer at Puhinui was designed for that express running to the Airport from the City Centre. As noted above these are the travel times on the Southern and Eastern Lines to Puhinui pre and post City Rail Link. Add five minutes for your transfer at Puhinui and then another 10 minutes down the Southern Airport Line to the Airport and that will be your rough travel time. Around 45 to 50 minutes from Aotea and slightly less from Britomart. The Northern Airport Line is if the Royal Oak option goes in around 50 minutes (with plenty more stops long the way). City Centre to Airport LRT Line. Think of it as Solaria’s City Centre to Airport via Dominion Road, Auckland equivalent with the Airport-Solarian Line (a metro/subway line) as the express Southern Airport Line). So if the Northern Airport Line is to be built with maximising catchment in mind while the Southern Airport Line is set for express running to the Airport how would you build the Northern Airport Line? Conventional wisdom is that you start building the Northern Airport Line from Queen Street in the City Centre down to Dominion Road as stage one then continue onto the Airport as stage two. All in all stage two should be done within a decade. 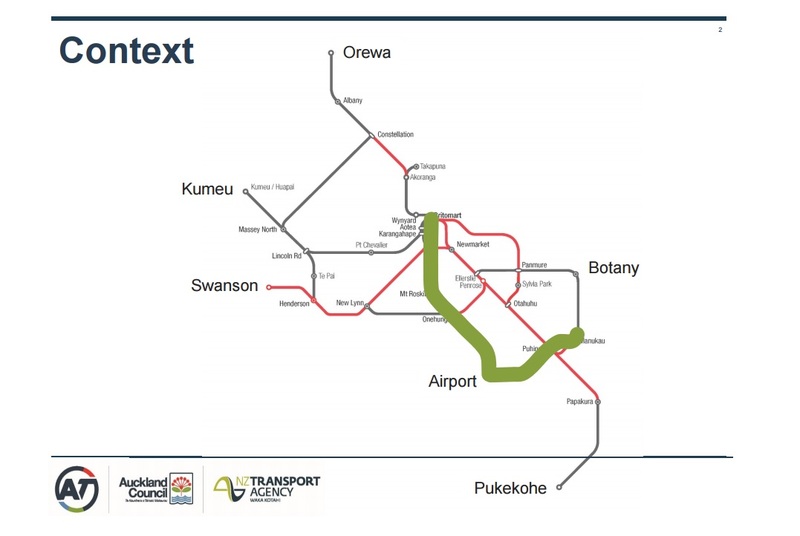 The Southern Airport Line is for now a Bus Rapid Transit Line from Puhinui to the Airport via State Highway 20B with that being all done by 2021 and the extensions to Manukau and Botany done soon after (according to Auckland Transport tender documents). To me this is half arsed and I think we can do a bit better here. Remember via budget control you can use smaller trams (that can be coupled up to make larger units as I can in Cities Skylines (75, 150, 210 (same as the single unit E-class)) to start with and up the capacity as the demand allows. I believe in the dig once, get it right policy that New Zealand struggles with (due to our often lack of foresight). 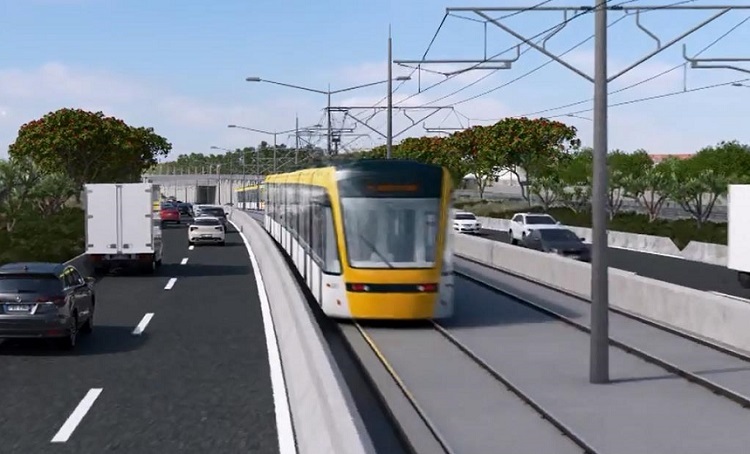 While building LRT instead of a busway for the Southern Airport Line between Manukau and the Airport is more expensive those costs are paid off pretty quickly from the demand and ambience side. While the Northern Airport Line is being built from Onehunga to the City Centre you have the option of either catching the train to Onehunga and transferring onto the Northern Airport Line to complete your trip to the Airport or use the Southern Airport Line. The Northern Airport Line to Onehunga first concept is courtesy of Nicholas Lee. The Southern-Northern Airport Line through-running concept is courtesy of Bryce Pearce. I give full credit to both gentlemen for these concepts. The above concept was brought up by Bryce Pearce. 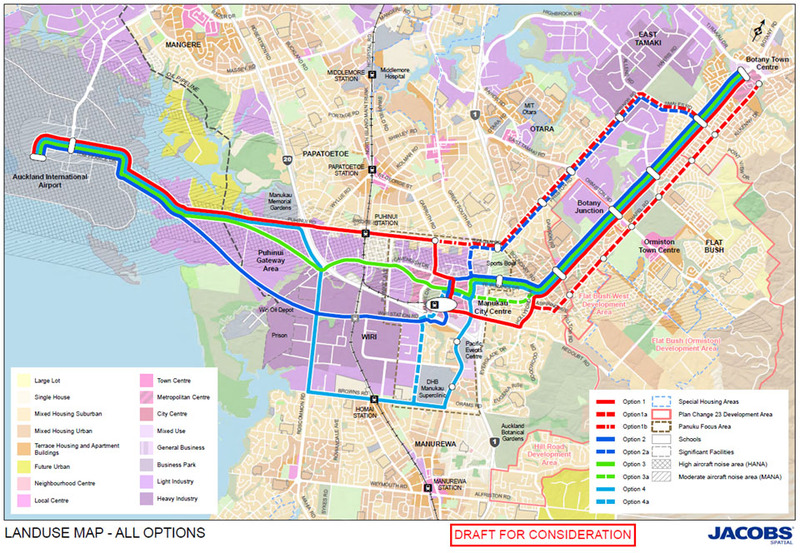 The idea is that the trains on the Northern Airport Line would continue through to Manukau via the Southern Airport Line and vice versa on the way back. This means no termination at the Airport Station and no cumbersome transfer for those in South Auckland who work in the Airport Industrial Complex along SH20A. The through-running concept is a stroke of brilliance as it widens the catchment of the Southern Airport Line. Basically only one transfer not two. What is the purpose of the Northern Airport Line and how do you plan to build it. Answer those two question and everything else including the Southern Airport Line falls into place.